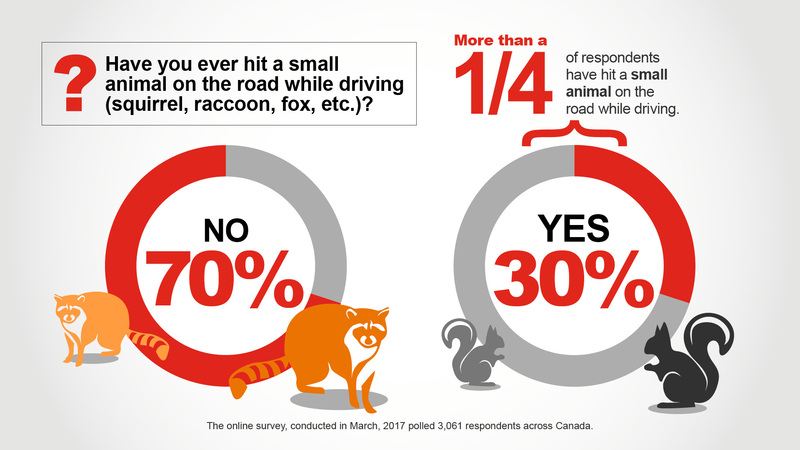 Aurora, ON (Oct. 26, 2017) – A new national survey from State Farm Canada sheds light on how Canadians react to wildlife while driving. About 1 in 3 drivers do not feel confident that they would know how to avoid a collision with a large animal, and over 80 per cent believe that better public education about how to react to wildlife on the road is needed to prevent collisions that could lead to injuries and fatalities. According to the survey, when seeing a deer in the middle of a two-lane highway, Canadians are most likely to brake (66 per cent) or take their foot off the gas (55 per cent). More than one-third indicated they would honk their horn and one-quarter said they would swerve. Infographic: State Farm asked Canadians their thoughts around the topic of wildlife and safe driving. Here’s what they had to say. 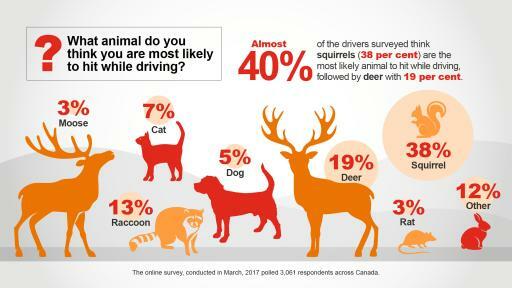 What animal do you think you are most likely to hit while driving? 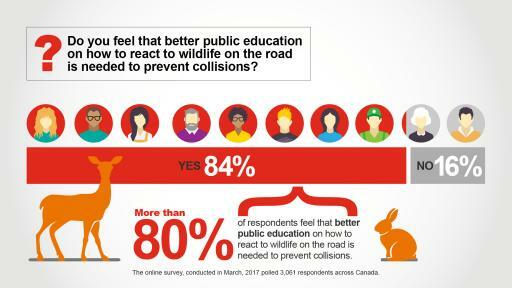 Do you feel that better public education on how to react to wildlife on the road is needed to prevent collisions? 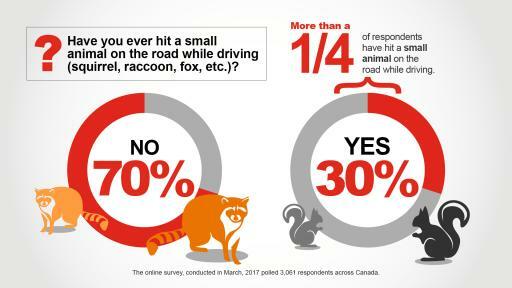 Have you ever hit a small animal on the road while driving? The survey indicates that Canadians want and need more education on how to deal with wildlife on our roads. The most likely time to encounter wildlife is at dusk or dawn, in October and November, on two-lane rural highways with speeds of 80 km/h or more1. From an insurance perspective the average auto damage claim after hitting an animal is $45002. 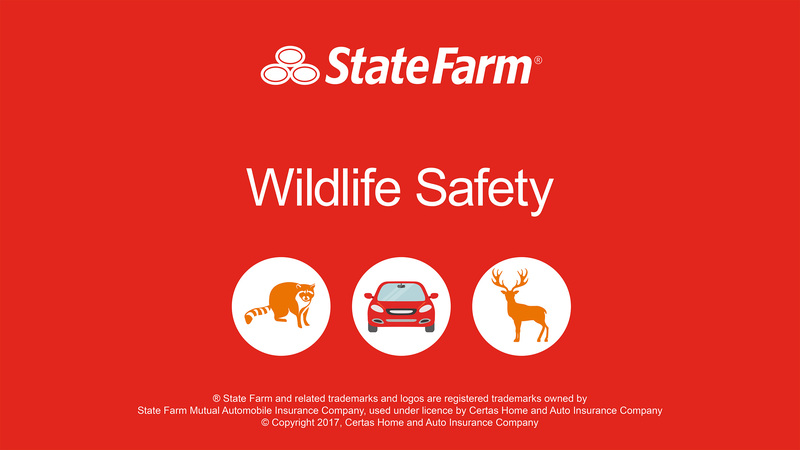 State Farm Canada’s long-time partner and road safety experts The Traffic Injury Research Foundation (TIRF) have developed an online information centre focused on road safety and wildlife. The Wildlife Roadsharing Resource Centre (WRRC) profiles tips on wildlife collision prevention, how to respond to animals on the road, tips for when a collision with wildlife is unavoidable and advice on what to do after a collision. ** Specifically, TIRF has produced a fact sheet to address some of the common myths and misconceptions around wildlife vehicle collisions. This is the final of three news releases State Farm will distribute in 2017 revealing survey results and the opinions of Canadians about their driving habits and road safety. The online survey, conducted in March 2017, polled 3,061 respondents of driving age across Canada. In January 2015, State Farm Canada operations were purchased by the Desjardins Group, the leading cooperative financial group in Canada and among the three largest P&C insurance providers in Canada. With approximately 500 dedicated agents and 1700 employees, the State Farm division provides insurance and financial services products including mutual funds, life insurance, vehicle loans, critical illness, disability, home and auto insurance to customers in Ontario, Alberta and New Brunswick. For more information, visit www.statefarm.ca, join us on Facebook – www.facebook.com/statefarmcanada – or follow us on Twitter – www.twitter.com/StateFarmCanada. *This information is provided for informational purposes only. Neither State Farm nor Certas Home and Auto Insurance Company, nor any of its or their affiliates, shall be liable for any damages arising from any reliance upon such information or advice. Its is recommended that an expert be consulted for comprehensive, expert advice. ** Neither State Farm nor Certas Home and Auto Insurance Company, nor any of its or their affiliates is responsible for the contents of wildliferoadsharing.tirf.ca and make no warranties or representations about the contents, products or services offered on wildliferoadsharing.tirf.ca. ®State Farm and related trademarks and logos are registered trademarks owned by State Farm Mutual Automobile Insurance Company, used under licence by Certas Home and Auto Insurance Company. 1,2 Wildlife Roadsharing Resource Centre, Traffic Injury Research Foundation, http://wildliferoadsharing.tirf.ca/.